Avoid treacherous ladders, tangled up Christmas lights, and family arguments this holiday season with our exterior holiday lighting and decorating services. 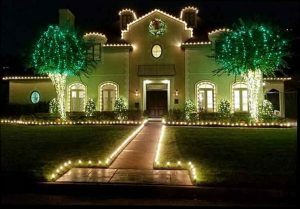 Our team provides turnkey holiday lighting services to our residential clients throughout Houston, which delivers big impact with zero hassle for the homeowner. Give yourself the gift of professional holiday lighting from Ignite Christmas Lighting. Our all-inclusive residential packages start at $2,000. Learn more about our pricing here. Our team of insured and experienced professionals offers quick and easy installation of your holiday lights, which means you don’t have to lift a finger. We also offer a full warranty on the exterior lighting, which means we will repair, replace, and troubleshoot any faulty lights for no additional charge throughout the entire holiday season. After January 1st, we remove the holiday lighting and provide storage of all materials until the next holiday season. To schedule your exterior holiday lighting services with Ignite Christmas Lighting, contact a team member today!